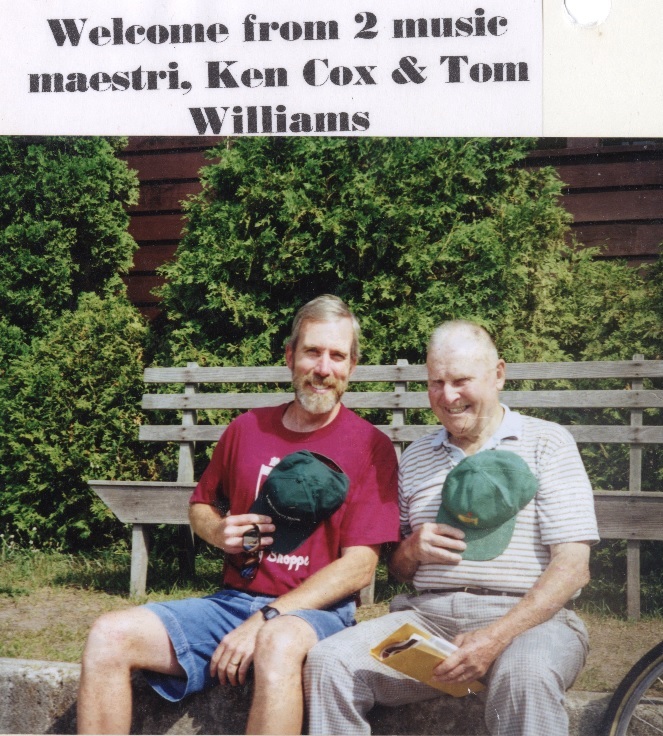 After Tom Williams retired as Music Director in 1986, the Music Director Search Committee report from 1987 stated, “As we all know, we cannot find another Tom.” However, shortly after that, they auditioned Ken Cox, and as Russ Freeburg explained in “There Ought to be a Place”, “Nowhere is the continuity of the Assembly more exemplified than in the relationship between the two men [Tom and Ken].” Tom was a mentor for Ken, who said in 2003 “I am, in many ways, walking in the footsteps of Tom Williams”. Like Tom, Ken also is a great musical educator and artist (twice turning down an offer to perform at the prominent Salzburg festival in order to come to the CSA). 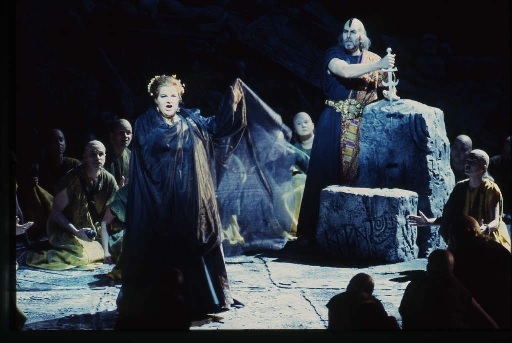 See picture to the right of an opera Ken was in. So after the Search Committee found that Ken fulfilled virtually every characteristic they desired (including diplomacy, patience, flexibility, cool headedness, vision, and the ability to explain and inspire), the committee unanimously recommended that Ken Cox be appointed Music Director. Ken Cox began this position in 1988, and like Tom, he continued in that capacity even after he was appointed Managing Director in the fall of 2000. Ken immediately fit right into his role, saying in the Assembly News in 1989 that “My first summer as director was rewarded with a generous amount of encouragement and support from the choir.” The search committee seems to have been right to foresee his vision for the choir. 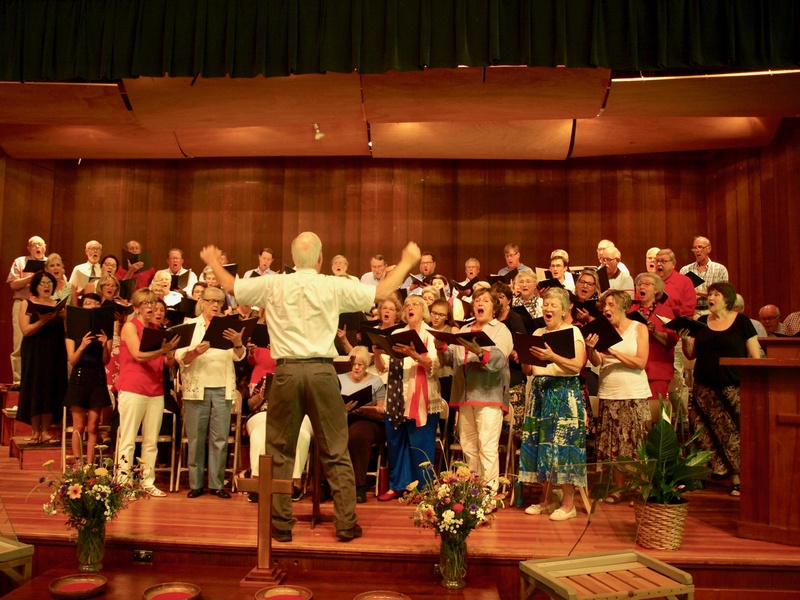 Since Ken started, the choir has increased in attendance, expanded the number of songs per service, and experimented with a few new pieces every summer. As Steve Elrick said, “We kept on singing the songs we were singing, but Ken expanded the choir.” The committee also was right about Ken’s ability to explain and inspire, a quality that cannot be truly understood without seeing it in action, so that is just what we will do. Friends drift in in twos and threes, chatting and laughing. New friends and lifelong friends, mothers and daughters, some of these people have known each other for more than half their lives, while others only feel that way. As they settle into their familiar spots according to their vocal range, conversations and laughter continue for a few more minutes across the rows with bodies cocked halfway around. After everyone settles in, a hush swiftly falls over the crowd as Ken waves his hands for silence. There is neither need for any words to bring about this calm nor any lingering conversation—the level of mutual respect and camaraderie in the room is palpable. The first order of business is addressing the young man in the room with the violin. Charlie Reisner is there to practice a possible prelude. While he plays, Ken listens intently. He is not afraid to push the norms of the choir, but will do so only carefully, only if this music will move the congregation. After listening and an applause, Ken moves the choir right along to rehearsal. The first song is a cold read which no one has sung before. Despite this, to my untrained ear it sounds great right off the bat. But my ear is untrained and Ken and the choir can hear they have a bit of work to do. In an interview later, Carol Gunkler will tell me that one of the things that she has improved most since joining is her ability to listen and discern whether music is being sung correctly. Despite needing some improvement, the mood is jovial, humorous even, as they take it from the top again and Ken weaves little suggestions and encouragements seamlessly into the music in tandem with the choreographed motion of his arms. The laughs are far more abundant than the commentary and yet neither sidetracks the team from its goal. Everyone is there to learn and improve. That is what they came for, and I am told later that the success of getting a song just right after working hard on it is one of the best parts of the choir. At the end of the practice, friends help each other up when they are experiencing trouble rising to their feet. Carol says “Some people are not able to do the things that they have traditionally done so we help them. And it is a very, its, ya know, cohesive. We take care of each other.” Once everyone is on their feet with a song in their hearts, they say farewell and leave as friends, ready to meet on Sunday. If ever there was a song sung in church that makes you feel like that, then come next season and join and sing it, with friends. There are so many activities to do at the CSA that one might assume have always been part of our culture. Most, however, did not come to be until as recently as a generation or two ago. There were no swimming lessons until 1931, Monday night dancing did not begin until 1954, and the first Cottage Treasures sale was not until 1976. 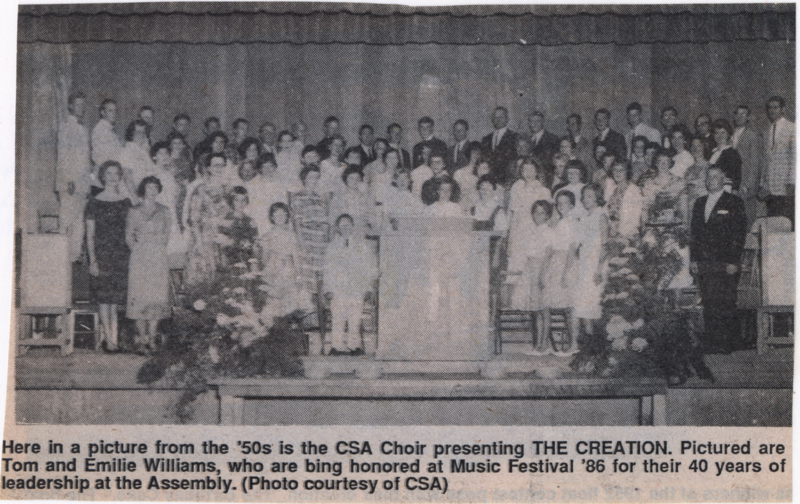 There is one activity though older than any other, older than any building on the grounds, which has been here since the CSA moved to Frankfort: The Assembly Choir. Beginning in 1904, the choir is older even than all three versions of the auditorium it now sings in, first performing in a large tent with a “Good sized pipe organ” but which “rain poured in upon at every vulnerable point”, then in the auditorium donated by Dr. R. J. Bennett in 1912. After the collapse of that one in 1959 they performed for “…nine Sunday outdoor services in a beautiful setting without a drop of rain” while “churchgoers donated huge sums” to build a new roof over their heads. When the auditorium again collapsed in 1962, they kept right on singing. From the beginning, assembly members and visitors have remarked at how exceptionally talented the choir is. In 1906 after a benefit recital, the Rev. 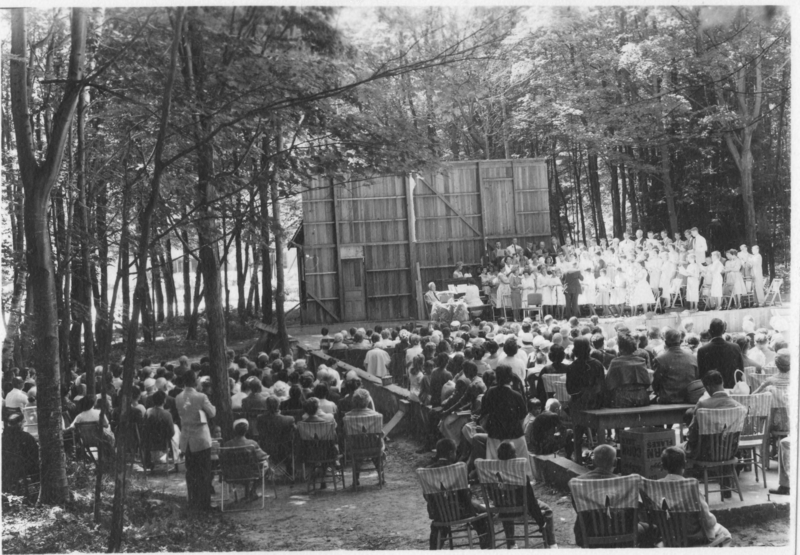 Nichols wrote “There is more talent in these woods than one dreams of.”, and in the 1921 Assembly News the program committee remarked that “No one thing, perhaps, has contributed more to our enjoyment and inspiration [than music].” Who is to say why this has always been the case? It could be due to the “ringy” acoustics beloved by choir member Liz Gottlieb, the “unusually high proportion of professional musicians” or the great directors lauded by long time admirer, first year choir member Carol Gunkler. Regardless, the choir seems to be sticking to its tried and true formula. 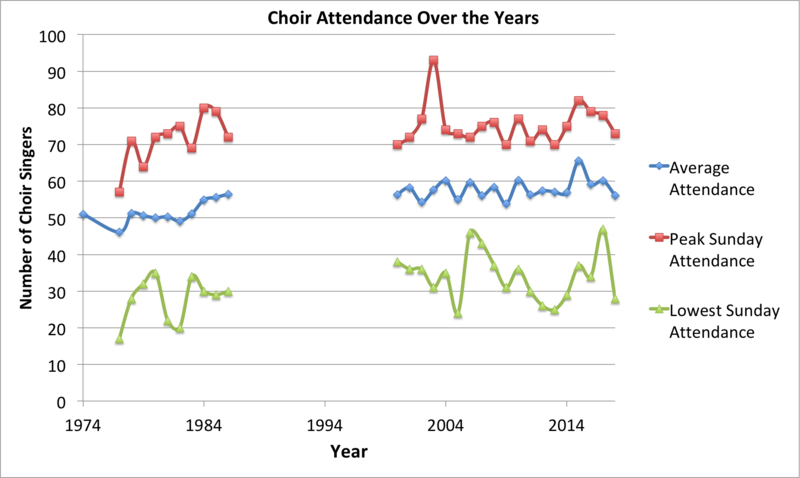 Throughout the past 70 years the adult choir has undergone very few major changes. While new members join every year and sometimes the practice schedule changes, in “There Ought to be a Place”, Russ Freeburg writes that “It is probable that the Assembly Choir has turned over completely only once in its history” and “The choir is steeped in tradition. The first time members join the choir each summer, they stand to introduce themselves. They tell where they are from and relate news about their activities over the previous winter.” And in the past 72 years we have only had 2 different permanent choir directors (although there were 11 before that). Perhaps the longest lasting change that the choir has undergone was the creation and slow dissolution of Children’s Choir. Founded in 1911 by then music director Margaret L. Weber, the Children’s Choir, sometimes called the “Children’s Vocal Training Club” or the “Junior Choir” functioned both as a youth activity, singing kid’s songs just for fun like “Happy Lil’ Sal” and going on beach picnics, and also as a precursor to the adult choir, occasionally performing hymns during Sunday service. This children’s choir was immediately a success and had high participation. It was a regular feature of the program when Mary P. Niemann became music director in 1928. Mrs. Niemann was a constant force at the Assembly for a long time, serving as the third longest running Music Director from 1928 to 1941 until wartime had other priorities for her as it did for many in the CSA. A force she was though, backed by one of the longest running assembly presidents and another spitfire, Katherine Macy Noyes, Niemann solidified stunt night and added the children’s operetta to the list of programs in 1931 for good. Not long after, the children’s choir and operetta were linked, with many of the children who were in one also ending up in the other. Although by all accounts he did a tremendous job running the waterfront, based on his musical background it made sense that when he was tapped to step in and become Managing Director in the middle of the season of 1957, he chose to give up the waterfront job but keep the position of Music Director. He led the choir for another 30 years before retiring. At that point, in an effort to find a new music director the board tried out several promising candidates for a few weeks each in the summer of 1987 including Tede Holt, Daniel Brill, and Ken Cox. Hang on for Part II next week for a look at the choir in the modern age. Who cares about the Itch? Who cares about the Itch? Everyone who loves our beautiful Crystal Lake! Swimmer’s itch has dominated discussion around the CSA for several years. A natural phenomenon, it is an allergic rash reaction being mistaken for a host species by a nearly invisible parasite (cercaria), which has gone through its life cycle and is searching for yet a new host. One of the links in its life cycle in Crystal Lake is the common merganser, a fish-eating duck that thrives in the lake’s clear, cool water where its brood of ducklings find ample minnows and fry to sustain them. Enough about the “itch.” What is being done about it? The Crystal Lake & Watershed Association (CLWA) has dedicated hundreds of volunteer hours and thousands of dollars it has raised to research and combat the insidious “itch.” Employing a private sector company, Swimmer’s Itch Solutions, the CLWA has worked with public input to locate, trap and relocate broods of merganser ducklings under a permit from the Michigan Department Of Natural Resources (MI DNR). While the adult hens may very well find their way back to Crystal Lake in the subsequent spring, their ducklings “imprint” on their new location and should return there in following years to breed. Relocation settings are approved by the MI DNR, and are waters near enough to be practicable, but far enough to deter a duckling’s return. These settings lack one or more elements of the complicated lifestyle chain that perpetuates the “itch.” The trap-and-relocate program is in its second year through the CLWA. Click this link to report a common merganser nest or brood on Crystal Lake. In 2017, 14 broods of mergansers were captured and relocated. A total of 116 ducklings were relocated along with 10 hens. To date in 2018, 16 broods have been captured and relocated, totalling at least 105 ducklings and 7 hens (three broods relocated late this week included an unknown number of birds as of this writing). Scientific analysis of snail samples (a key element in the life cycle of the parasite that causes swimmer’s itch), in 2016 showed a ratio of infection in the snails of 1/100 sampled. The sample in 2018 showed a significant reduction, in which only 1 of every 350 snails sampled were infected. The CSA has worked closely with the CLWA by recording statistics on the waterfront that reflect the number of swimmers each day (broken down by morning and afternoon); the incidence of rashes reported (similarly broken down); the wind direction and velocity, and water temperature. Leslie Ritter, CSA Waterfront Director, and her staff have done a remarkable job in documenting these factors on a daily basis for a period of 6 years. Trying to compare apples to apples, some numbers from two years - 2016 pre-program and 2018 the second year of program. While this information is perhap a bit anecdotal, taken as a whole it shows that the efforts of the CLWA are working towards reducing the natural phenomenon of swimmer’s itch to an acceptable level. Leslie Ritter told me she was holding her breath when the 4th of July week began, and she was thrilled that the incidence of “itch” remained so low. 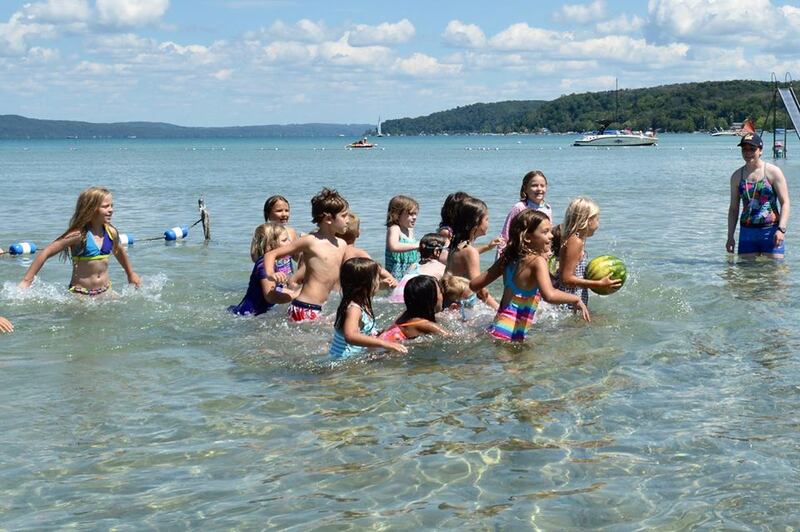 Parents are letting their kids swim again, and today was a classic reminder of what a unique jewel we are in temporary custody of - Crystal Lake. The CLWA is hard at work to preserve this resource for generations to come on many levels: the “itch,” the spread of invasive species, working with local units of government to protect sensitive habitats and limit non-point pollution, and so on. If you are not already a member, please join the CLWA to insure the lake’s qualities for generations to come. Come to the CLWA annual meeting this Saturday, July 21st, at the CSA Assembly Building beginning at 9:30 am. You will see many familiar faces, and you will help insure our mutual future. We are lucky to have in our CSA community writers, poets, novelists, playwrights, biographers, actors, directors, producers, painters, potters, dancers, singers, musicians and a plethora of other artistic talents. Some people who have professionally gone into a number of artistic careers got their starts in operettas, participating in arts and crafts and singing in the Sunday choir. Along with our regular operettas, arts and crafts classes, authors and artisans gatherings, and concerts, over the years many other events have taken place. As Stunt Night was revived, it became clear that not only does the CSA love fun cultural events, but also loves to share serious creativity. Poetry recitation, serious music and story reading sometimes have shown up in the Stunt Night programing, along with silly and playful offerings. Looking back through Assembly history in the past plays were performed along with--or instead of--operettas. In recent years, different members of our community have offered some inspiring artistic events. Bruce Clements directed a reader’s theater performance of the play “The Winslow boy” by Terrence Rattigan; Gibson family members have offered magical evenings of poetry and music. So, how did the Arts Committee happen? A few years ago, a group of CSAers started talking about expanding arts programing. A proposal was brought before the Board of Trustees and the Arts Committee was formed in the fall of 2015 and started activities last summer. The first co-chairs of the committee were Barb Perry and Jane Taylor. While Barb leads the CSA as President this year, Jane Taylor leads our artistic community as the chairperson of the Arts Committee. 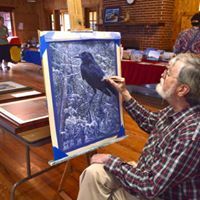 This year, the arts are alive and well at the CSA in many of the usual ways that our community is used to seeing including Stunt Night, Artist Workshops (with help from the Women’s Association), periodic poetry challenges, and a book discussion group. All these current offerings were created or supported by the Arts Committee. Two new workshops demonstrate the goals of the Arts Committee. Friday afternoon writing gatherings were created because a member of the committee, Julia Gibson, felt writers would benefit from the focus and intention in gathering to write. Friday afternoons at 2:00pm in the Lounge, all are welcome to join the quiet gathering of writers, whatever your area of writing might be. Another workshop was created when members of the committee noticed that sometimes participants felt lost in the arts workshops. We thought it would be useful to offer solid training in basic drawing skills, a training that is missing from so many people’s background. 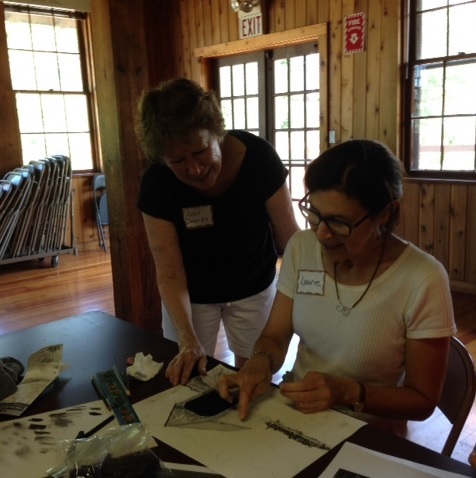 We approached Judy Dawley about starting a series of instructional art classes to help people develop those skills. On Thursday afternoons the packed class consists of people of every experience level. Everyone learns something new. Judy has a strong background in teaching artistic skills, and she was the perfect person to create this series of classes. She offering a total of six classes this summer each concentrating on different skills. Come join us Thursday afternoons, July 12 – August 16, from 2-4pm in the Assembly Building. In the future, the committee wants to help artists with whatever they dream of doing here. We can imagine things like a Reader’s Theater, instrumental music groups, hymn-writing workshops, trees-in-art celebrations, storytelling evenings at the fire pit, open mic performances, photography gatherings and plein air painting throughout the Assembly. We hope to coordinate events with the Spiritual Life Committee, with whom we feel we have some overlap of interest, and also with Ecology and Youth programming. So bring your own ideas – we want to hear them! Ask for support from the Arts Committee whenever you want help creating a new activity. New members who are ready to work on some aspect of the programing are welcome to join the committee. We look forward to fanning the flame of creativity in many new ways. We hope you are enjoying the activities we have started and would love to hear from you! Do you regularly interact with the CSA community on our Facebook page? Maybe you’re excited to see a cool CSA picture on Instagram. 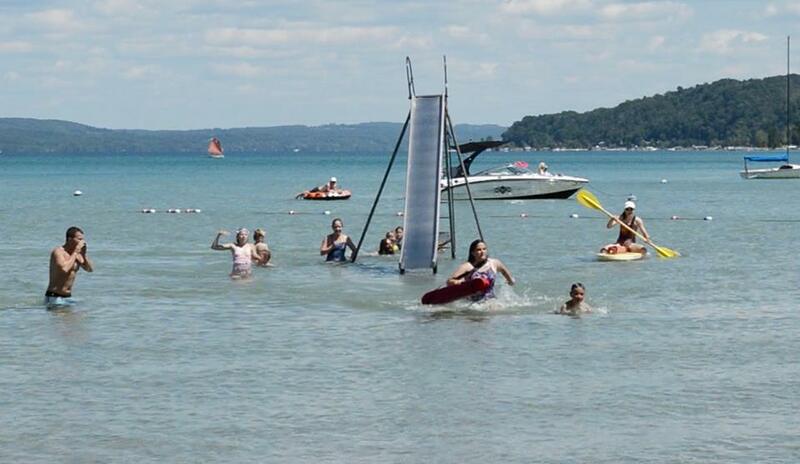 Or perhaps the calendar and white board photo on the CSA website, or the weekly “what’s happening” emails, help you plan your time at the lake. All of us who enjoy being able to engage digitally with our CSA community year-round owe a big thanks to Doug Fuller. It’s been almost 15 summer seasons since Doug took leadership of what was initially the CSA Website Committee. Would you believe there was some controversy over the CSA even having a website in the 21st century? Doug provided balanced and thoughtful leadership to demonstrate that having a digital CSA presence would not diminish the traditions and enjoyment of being physically present at the CSA. Doug not only provided leadership for the committee, he did much of the technical work to create the initial site, with valuable assistance from Peter Buzzell. Doug did research to find the right platform to allow everyday users to create and manage a high-quality website without the experience of being a web developer. He toiled for countless months to give us a nice initial site, with very little investment. Once the site was up, initial traffic was light due to the CSA’s requirement for a password to protect our privacy. But Doug was able to help CSA leaders get comfortable with fully opening the site, which put us on the path to where we are today, and where we can be tomorrow. Doug worked diligently with our committees to get content onto the website and keep it current and up to date. It wasn’t easy, and it wasn’t perfect, because he was asking for more time from dedicated CSA volunteers with very busy lives. So, what to do? He found a different path. He told the Board of Trustees we should focus our effort on the CSA Facebook page. He was right once again. Through Facebook, Doug was able to offer a forum for CSAers to interact year round. And the statistics he provided to the Board built confidence that the addition of digital media was good for our community. By then we were using YouTube and Twitter, with Instagram to come. Just a few years ago, Doug recommended to the Board that we change our technical web platform from Word Press to Joomla, to give us more and better capabilities. Who did the bulk of the work to make the change? No surprise, it was Doug. He demonstrated that he was a visionary leader when he recommended that the “Website” Committee be changed to the Communications Committee to better represent its evolved role. Doug understood that we needed to fit into the communication options being used every day by our community—both while here at Crystal Lake as well as wherever we are in the world. With more parents working and busy families, fewer people can be here all summer. But they still want to feel a part of the community. They still want to engage with the community. And they want transparent communication about what is going on within our community and our governance. Doug resigned from the Communications Committee when his wife, Sharon Elliott Fuller, was diagnosed with a serious illness. But he supported the successful trial of a communications intern in the summer of 2016. Holly Freeburg succeeded him as chair of the Communications Committee that summer. She was able to prove the value of the communications intern and expanded it in 2017 and 2018. We lost both Doug and his wife Sharon in 2017, much too young and much too soon. It was a very difficult loss for their daughters Crissie and Kelsey, and their son Elliott. It was also a very real loss for our community. We honor his unsung service to help us maintain an energetic and engaged community far into the future. There are any number of words to describe who Doug was: dedicated, hardworking, effective change leader, someone who thinks outside the box, friend, nature lover, nice guy. But he was also very much an unsung hero around the CSA and we could not think of a better person to kick off our new unsung heroes series than Doug, who will be missed terribly not only taking the stage during the operetta, but as someone who always had a kind word and advice. 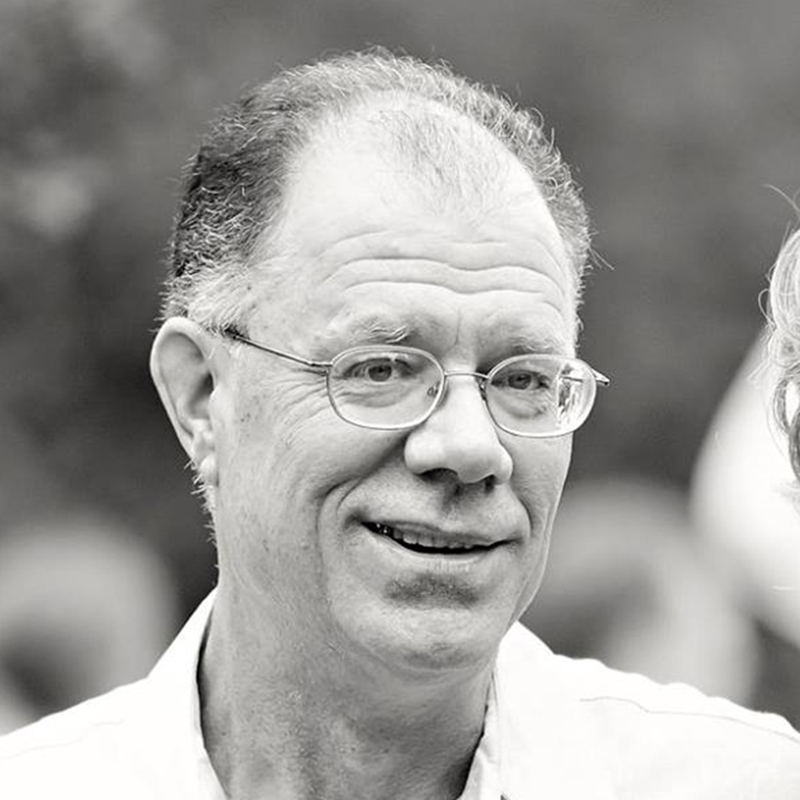 If you would like to read more about Doug and his life, click on this link to his obituary. Could we be Swimmer's Itch Free by Next Summer?